Are you suffering from chronic snoring, morning headaches, and daytime exhaustion with no understanding of where these symptoms are coming from? Have you been diagnosed with sleep apnea only to find that the traditional CPAP treatment doesn’t work for you? Wherever you are in your journey towards the quality, uninterrupted rest you deserve, Dr. Luke Lumpkin and the rest of our team at Dentistry by Design can provide a helping hand. 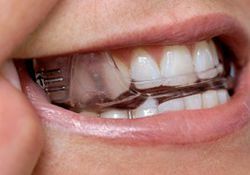 Many patients aren’t even aware that a dentist can help treat sleep apnea therapy, but it’s true – customized oral appliances are often a convenient and comfortable solution that can result in lasting improvements for your overall quality of life. Obstructive sleep apnea occurs when a patient’s airway becomes partially or fully blocked while asleep. This leads to a dangerous decrease in needed oxygen, prompting the brain to rouse the patient so they can readjust. These interruptions can take place countless times each night, resulting in fragmented, unsatisfactory sleep. Your new oral appliance will have a simple purpose – once in place within the mouth, it repositions the jaw comfortably so that the airway is not able to collapse as easily. This keeps air flowing freely and helps you stay asleep so that you can wake in the morning feeling refreshed and rejuvenated. Contact our Bartlesville, OK practice today if you have any questions, or if you’re ready to schedule your first appointment!